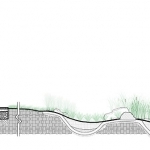 Narrative landscape space, in which knowledge is acquired by experience. 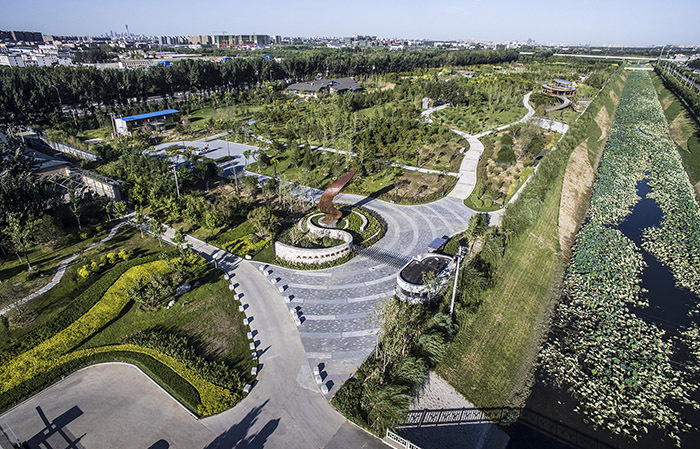 Daxing Ecological Civilization Education Park is located on the north side of Daxing District, south side of the South Fifth Ring Road and the north side of New Media Industry Park which is close to the Xinfeng River, with total area about 141,456m2. 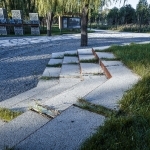 It is at the edge of the main city area of Beijing, near new city plate and airport radiation zone.This urban-rural junction area becomes the key areas of industrial restructuring & upgrading and green regeneration in Beijing, facing the pains and challenges of large-scale low-end industry closure, demolition of abandoned and old buildings, and removal of mobile personnel. 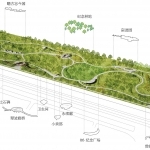 In April 5th 2016, Xi Jinping and other national leading comrades took part in Arbor Day’s activity in the original site of the park and advocated “knowing and doing under the feet”, “building Daxing well”, also promoted urban renewal and green regeneration in suburban areas. 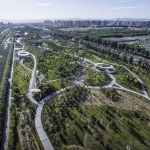 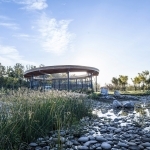 Daxing Ecological Civilization Education Park was born in a series of changes and events in this urban-rural junction area. 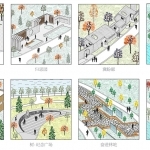 From west to east, Daxing Ecological Civilization Education Park arranges four related gardens according to narrative logic, which are named Imagination Park, Wisdom Park, Knowing and doing under the feet Park and Endeavour Park respectively. 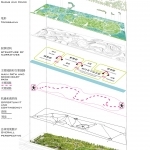 It presents a linear progressive relationship between “Natural Imagination”, “Universal guidance”,”Education Memorial” and “Hard Practice,” and runs through a primary garden road and a circular ecological trail respectively. 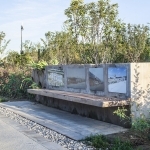 This linear narrativemethod is likea continuous image space shown on film, also like a hand roll of garden painting, which is both flat and coherent with linear narrative relevance, and also combines with static or dynamic narrative site design to increase experience and aesthetics, andto lead thinking. 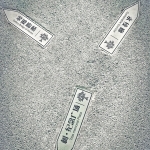 Just as narrative implies “the way in which knowledge is acquired by chance of action and experience” (MatthewP3), the meaning hidden behind the narrative structure and place is segmented, coincidental or encounteredand suggestively revealed to trigger the spontaneous knowledge, understanding, integration and empathy of the visitors rather than trying to “seek universal truth” (MatthewP4). 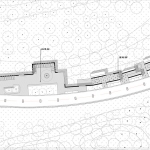 Architectural sketches (or landscape sketches) in the traditional landscape have been redefined as a more active concept of “gray architecture”, that is, fuzzy spaces and structures between architecture and landscape,with the dual personality of architecture and landscape. 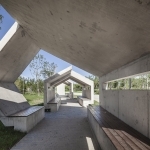 The “gray building” group in Five Ring Park has a complete spatial form, meaning symbol or intimation, as well as the overall material characteristics to form a series of “eventful” places and actively encourage visitors to participate in “events” and experiences. 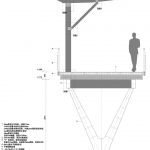 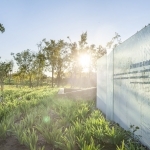 maginationPark is the first movement of the Ecological Civilization Education Park, with imagining the natural and desiring for pastoral as the theme and reflecting the inherent desire of human beings to the natural environment. 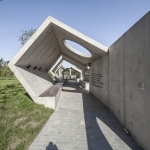 Located in the ImaginationPark, Past & Present Park is a series of continuous linear group gray buildings, which is close and parallel to the mainpath. 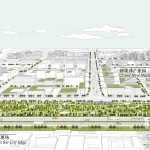 It is consisting of HomesicknessPark and Hope Corridor which are the concrete cast-in-place belt type view gray buildings. 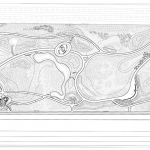 In which Homesickness Park takes “bamboo slips” as the design prototype, extracts the spatial features of Chinese traditional gardens, and creates an ornamental space.Through the picturesque description of landscape idyllic poetry, it describes the Chinese yearning landscape pastoral in detail.Hope Corridorforms a recreation veranda with combination of changes in the form of abstract geometry. 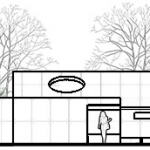 This group of linear sequence spaces is with pleasant scales and pure materials; Using abstract architectural symbols, wall top conversion or disappearance or hole and other interesting architectural techniques to guide visitors’ sight and behavior experience; the text of the world’s efforts and course in coping with environmental change is refined from the wall ceiling to enable the traveller to recognize, understand, and reverie in the fragments of the event record. 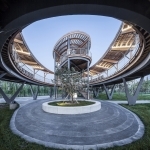 Wisdom Park is the base of knowledge popularization and ecological consciousness guidance of the Ecological Civilization Education Park. 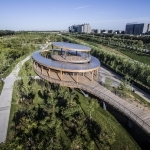 Gallery Bridge of Waves, a large gray building located in the Wisdom Park, is a kind oflandscape bridges that combines steel and wood structures withtwo layers of the main body and three layers of the part, and next to the secondary ecological path.As a unique urban symbol at the northern end of Guangyang Avenue, the 150 meters flying bridge not only strengthens the urban landscape interface of Beixing Road, but also becomes an important urban node, which is in contrast to the booming industrial parkwith implicit praise for ecological civilization and urban development.The lower part of the bridge is loaded with Y-shaped steel columns and welded with foundation, which is like the motion of pheasant flying; the upper part adopts the composite wood structure of heavy glued beam, wood column, local steel structure. 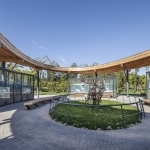 Gallery Bridge of Waves is the narration of spontaneous experience and association of behavior and movement of time; it is a romantic imagination after a short trip.Visitors cango to the third level of the platform through the approach bridge and the ring platform, during the changing height, walk inthe forest, overlook by the hurdles, and feel the unique experience of viewing.In near view, visitors canenjoy the green of park and central Arbor Day memorial woodland; inhorizontal view, they can overlookthe urban changes of Daxing and the new media industry base; in far view, they can overlook thecity silhouette ofDaxing and the afterglow of West Mountain. 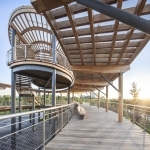 Nature, city and the heart of the “unobstructed spirit” are combined as a whole. 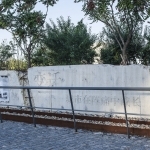 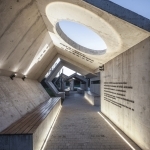 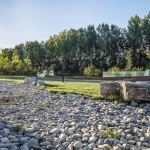 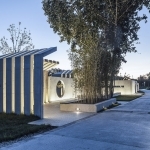 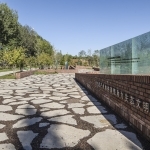 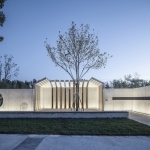 Located in Wisdom Park, Sustainable Corridor is a large rest space composed of the rounded stone cage wall filled with aggregate by demolition waste, and the supporting structureby steel and wood and the top member, and connected by the main path and Past & Present Park of ImaginationPark. 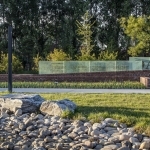 Outside the walls of the stone cage, the four walls of Sustainable Corridor show the cycle and symbiotic process of the natural ecosystem that plants grow in earth, plants grow and nature communication, relationship of animal growth and plant, and the supplement of soil components by the remains of animals and plants under the action of organic microorganisms etc. 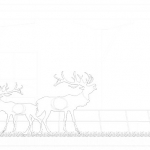 Sustainable Corridoris a static narrative that conveys the everlasting proposition of the ecosystem that goes round in circles and continuous reproduction.In the middle of the structure there are two moose strapped with old steel hoops, roaming on the green grass far away by shallow wetlands, showing a peaceful and gentle picture of nature. 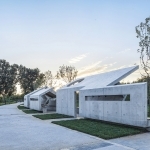 Enter Endeavour Park through the Central Knowing and Doing Under The Feet Park and Tree Memorial Square. 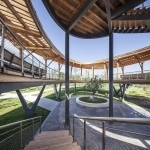 Endeavor Park is the end of the Ecological Civilization Education Park. 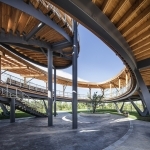 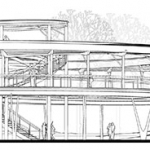 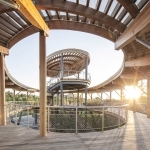 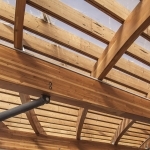 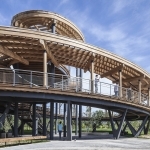 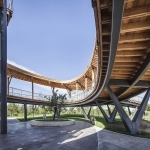 Through the construction of Endeavor woodland and other places, it reproduces the course of ecological civilization practice in Daxing District.Located in Endeavour Park, Rainbow Porch is a special steel-timber structure rest gallery with circular arch.The starting line and the finish line ofRainbow Porch are parallel to the river banks and flood control lines, and the two-way curved corridor body consists of two curved steel beams and the wooden connections between them;the supporting structure is also like the Y-shaped steel column of Gallery Bridge of Waves. 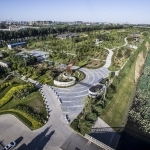 The modeling of tranquil and wings to fly symbolize harmony also mean soaring.Rainbow Porch and Gallery Bridge of Waves are located on the north side of the secondary ecological path, at the northern extension point of Guangping Avenue, the sub-trunk road of New Media Base, and at the north end of Guangyang Avenue of the main road,respectively. 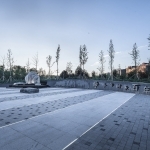 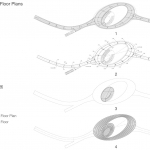 This arrangement makes it an important landscape area of New Media Base,at the same time, facing the booming ecological civilization construction and the urbanization development area in the urban and rural areas, the flying form has the extremely strong symbolic significance. 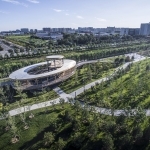 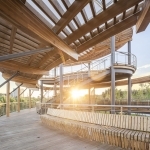 Daxing Ecological Civilization Education Park, which is built in the green reproduction area of the urban-rural joint area, has a linear narrative structure with the contemporary simple space shaping method to complete the functions and enlighten sublimation of the park. 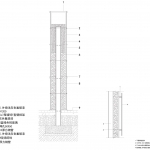 The grey building group is highly involved in the narration of the place. 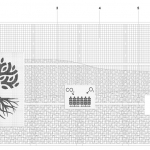 The narrative rhetoric made up of the narrative content and the formal medium of the narrative content is attempted in a more open and abstract way. 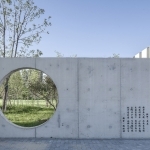 This not only constructs the logic and sequence under the frame of thematic narration, but also creates a happy and romantic viewing experience, like a continuous hand scroll of garden paintings, showing the unity of narration and poetry.